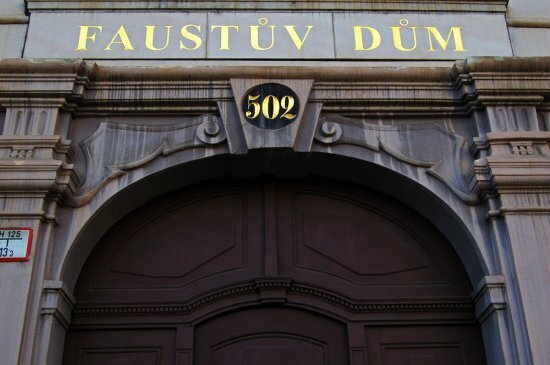 The mysterious Faust’s house, which is located on the present day Charles Square in Prague (former Cattle Market), has quite a strange story. Where does the “Faust” come from? Does it have anything to do with the famous Dr. Faust? Let’s look into the well-known legend which is bound to this building. Once upon a time, there was a poor student living in New Town. His clothes were old, shabby, and full of holes. His shoes were broken and leaked. He lacked money to such an extent that he fell a few months behind on his rent payment and his landlord ran out of patience. Suddenly, he found himself standing outside the door with no place to go. He walked the streets of New Town, hoping to find shelter from a heavy rain. 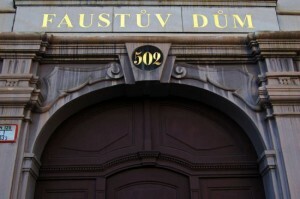 As he passed the Faust House, he spotted that the main gate to the building was ajar. Tired and hungry, he sneaked inside the house. It was full of fascinating and mind-boggling things. As he looked around he also looked up towards the ceiling and, there, he noticed a large hole burned black at the periphery. He remembered the legend connected to this house he had heard from an old fellow. According to the story, the previous owner of the house had disappeared and nobody had ever seen him again. It was said the devil himself took that man from his bedroom, their bodies piercing a hole in the ceiling as they flew straight to the hell. His was a great punishment not only for his greediness, but also for his dreadful cruelty. After the initial joy of finding shelter faded, the student became less and less comfortable. He increasingly felt more and more afraid. However, his poverty laid heavy on him. Eventually, as he had not yet encountered any ghosts or creatures after being in the house for several hours, he decided to stay. He repaired the ceiling by covering the hole with a piece of old carpet. The next morning, he awoke to sharp hunger pains. He searched the room for anything edible but found only a silver coin in one of the many ceramic bowls. He hesitated to take it but his hunger was stronger than his modesty. He took the coin and with it bought himself a decent breakfast and still had enough money left for lunch. The next day he found another silver coin in the dish again. This happened again and again until he began to believe that his misfortune was coming to the end. He had enough money to eat well every day and shortly after he was able to get new clothes and shoes. The strange things in the house, mechanical toys and a big library full of alchemist’s tools intrigued him. 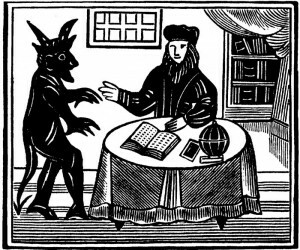 He was so amazed by his discovery that he started studying the old magician’s books and parchments. He realized he did not have to work at all because a shiny coin appeared in the bowl every day. His new life was so wonderful and carefree that he did not worry about money and kept spending it since the bowl was seemingly bottomless. On a cold November day a wanderer sought shelter in New Town where he found the main gate of the Faust House open. He entered and went upstairs ready to rest but, when he looked towards the ceiling, he froze in panic. The furniture was broken, shreds of tattered clothes were strewn all around the room, opened magician books were lying on the floor in the middle of the room and the carpet, which had originally been covering the black hole, was stripped down crumpled on the floor. The entire room and the edges of the black hole were stained with dry blood. It seems the devil had not been conquered and the house has remained shrouded in mystery ever since. The legend of the Faust House is one of the most famous legends in Prague. Let’s do some investigation and find out how much truth is actually behind this legend. The first written record about this house dates to the time before Charles IV founded New Town in the 14th century. 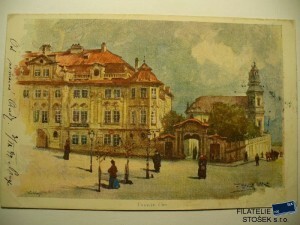 Originally, it was the Palace of The Dukes of Opava, who had a bewitched reputation because their devotion to alchemy. But the significance of the place on which the house was built dates back to pre-Christian times. At the location of today’s building, there used to be a pagan sacrificial ground devoted to the death goddess Morana. Therefore, the name of this place “Na Morani” has been preserved to this day. A long time before New Town was established, there was a fenced yard guarding the important trade route “the Royal Route” that linked Vysehrad with Prague Castle. For centuries this route was also part of the coronation route for Bohemian kings. Nobody knows when or who dubbed it the “Faust House” and there are no written passages about it in any historical document. Doctor Faust (Johann Georg Faust) was a wandering alchemist, astrologer and magician. Rumors about him floated around even during his lifetime. It was said that he associated with the devil. The house is connected to Faust’s legend, although, according to historians, he never lived there. The legend probably arose due to several successive homeowners who were devoted to natural science and alchemy as was the wandering, magical Faust. The first known owner of the property was Jaroslav Kapoun of Svojkov who was quite dubious. The scaffolds claimed his life in 1539. The house was forfeited to Emperor Ferdinand I who gifted it to his personal doctor Jan Kopp whose hobby was alchemy. With great probability, Kopp had an alchemist’s laboratory in the house. Next in line was Edward Kelly, a court alchemist of Emperor Rudolph II. Kelly settled into the house in the late 16th century and most likely is responsible for the alchemy-themed frescoes now found on the walls. Apparently, he carried out his largely mysterious experiments on the grounds. It is therefore not surprising that the house, with its doubtful reputation, has become subject to dark rumors among people. They are loosely linked to the legend of Faust. But, what actually happened in this house? Was it really visited by the devil himself? 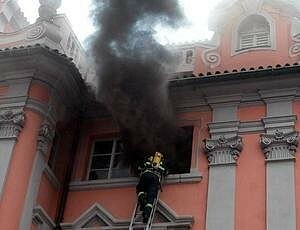 More of the house owners were members of the Mladota of Solopysky nobility. They acquired the house in 18th century when Ferdinand bought it. He (along with Josef who constructed mechanical toys and conducted technical experiments) probably most closely resembles the reputation of Dr. Faust because of his fondness for physics and alchemy. 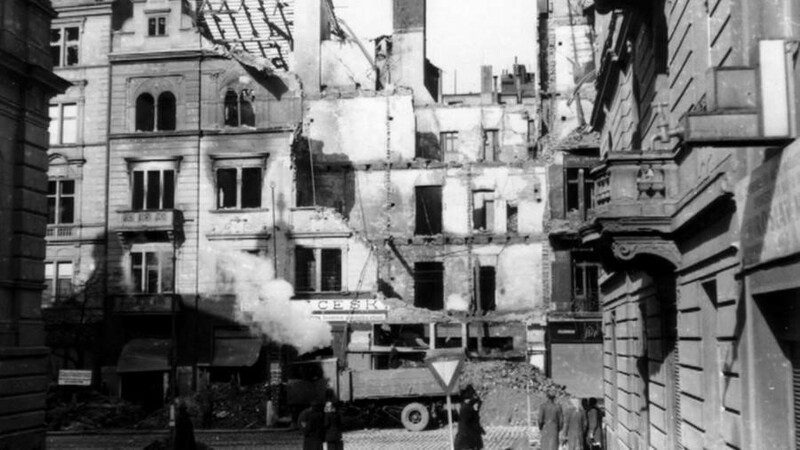 Occasionally, people heard explosions during the night and saw flames lapping from the windows. There were visible moving figures and other strange machines in his house. The Lords of Mladota showed their rich collection of moving toys to their guests. What exactly were these “creatures”? It raised the idea of these men being in league with the devil. That’s probably when the fate of the sorcerer’s house started to intersect with the popular stories about Dr. Faust – and the “house of Dr. Faust” was born. The Mladota family also supposedly manufactured medicinal ointments and other products right in their house cellar. That is why we could assume that the basement of the house has not brought up all of its secrets. Another distinctive and more modern owner, who revived the devilish legend in the 19th and 20th centuries, is Karl Jaenig. He was chaplain of the adjoining St. John of Nepomuk Church. He had a special interest – he was obsessed with everything linked to death and funerals. Most intriguingly, he owned a human skull and part of a gallows, he slept in a coffin, and he decorated his room with black funeral banners. Was is just a coincidence that the man with such a preoccupation would reside on the former grounds of the death goddess?